A complete-game shutout thrown on fewer than 100 pitches is commonly known as a "Maddux." Monday night in Asheville, Sam Howard did almost 20 percent better. 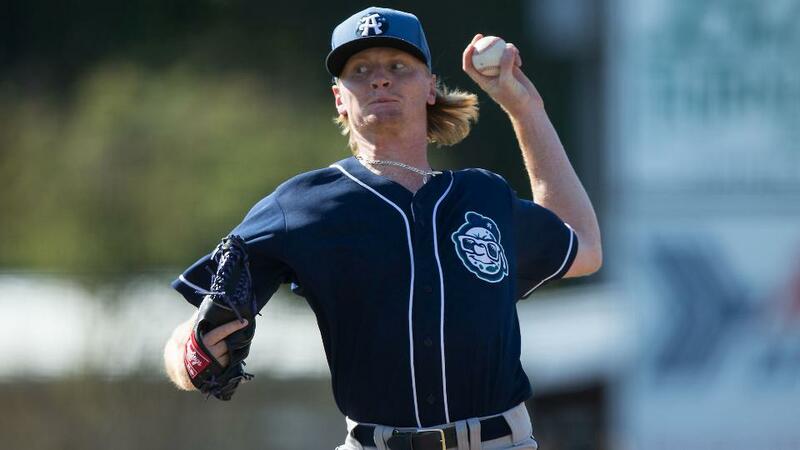 The left-handed Rockies prospect needed just 81 pitches to go the distance in the longest outing of his career, scattering four hits while striking out five without a walk over nine innings as Class A Asheville blanked Rome, 2-0. "Everything was clicking," Howard said. "The ball out of the glove, throwing right at my target, everything was clicking and right on time. My defense was playing great, making some great plays behind me. [Second baseman] Max George made some good plays for me. Luis Jean at short and Yonathan Daza in right made some very big catches. When the defense can do that behind you, it makes the game go a lot faster and a lot easier." Even when he was giving up hits, Howard (6-8) was moving briskly and working out of jams efficiently. After Stephen Gaylor's leadoff triple in the first inning, he retired nine straight. After Omar Obregon doubled to open the fourth, he sat down eight more Braves in a row. "This is the [third] time I've faced them," Howard said. "From batter No. 1 in the first inning, they were swinging out of their shoes on the first pitch, trying to guess first-pitch fastball and sit on the fastball. As long as I still got the fastball inside on them, they were jamming themselves, so I kept doing that. When a guy was really trying to jump on the fastball first pitch, and you could tell he was really out front, I'd just use an offspeed pitch, a slider or changeup, and get him off balance. He'd ground out or swing and miss." That formula served the southpaw well. Howard and catcher Dom Nunez picked runners off the basepaths to end the fourth and sixth, enabling Howard to face the minimum in seven of his nine innings. "I definitely thought it was going to be a big challenge just because they've seen me," he said. "They know what I have. But the last few times I've faced them, I've had more swings-and-misses. I think that's why they tried to make an adjustment today, swinging first-pitch fastball every time to try to put the ball in play and not get behind and let me throw a slider at them or a changeup." Howard improved to 1-1 with an 0.84 ERA in 21 1/3 innings against Rome this season. The win boosted the Tourists' second-half record to 19-11 in their defense of the South Atlantic League crown. "The second half, we're really clicking as a team," Howard said. "Everybody's having fun and staying relaxed. We're reminding each other to play for the team, trying to get wins for the team, for each other and not for our own stats. "We all knew coming to Asheville from Spring Training the high standard the teams have left the past three years over here, winning the title twice. We knew when we came over that we had to get to business and try to do what they did."